Drinking well at release but will benefit from cellaring to 2017 or beyond. An excellent 7/7 point vintage - described as the 'best in 30 years on the island' with great fruit set, prolonged dry spells and good warmth maintained to the end of the season. The vines were in their 5th year and were intensively canopy managed with shoot thinning, fruit thinning and shoot positioning. The vines were harvested at 1.2k/vine. The fruit was hand-picked in the cool of the early morning, sorted in the field, destemmed and lightly crushed within 30 minutes of harvesting. After early innoculation, fermentation was carried out in small batches in open-top fermenters with hand plunging. After a two-week maceration on the skins the free-run wine and a small amount of light press wine (0.5 bar) was run to barrel. Maturation: 30% new medium toast French oak. Low sulphur regime, no animal products. After several rackings the wine was bottled without fining. Cellar aged. First release Cellar Door September 2009 and Island of Wine Expo, Auckland, September 2010. Single vineyard pure 100% Montepulciano grapes in Abruzzo Riserva style, barrel and bottle aged. ReleasedAugust 2012. Drinking well at release, but will benefit from cellaring to 2015 and possibly beyond. 7 to 8 point vintage. Good flowering, tendency to over-large crops for some, unsettled late Feb / early March, but dryer late summer and autumn right through April, with unusually cool nights both March and April. Good ripening. The vines were in their 6th year and were intensively canopy-managed with shoot selection and thinning, shoot positioning and green harvest. The vines were harvested at 2.8k/vine. The fruit was selectively hand-picked in the cool of the early morning, sorted, destemmed and lightly crushed within 30 minutes of harvesting. After early inoculation, fermentation was carried out in small batches in open-top fermenters with hand plunging. After a 17 day maceration on the skins the free-run wine and a small amount of light press wine was run to barrel. Maturation: 30% new medium toast French oak. Low sulphur regime. After several rackings, the wine was bottled without fining. Cellar aged. First release Cellar Door August 2012 and 2012 Waiheke Island of Wine Expo, Viaduct Harbour Auckland, September 2012. Good ruby and velvet, some carmine. Bouquet is simply beautiful montepulciano, fragrant, darkly floral, intensely berried, slightly spicy, but unlike so many of the wines from this grape’s homeland, this one is perfectly clean. Palate is soft rich and velvety, the oak in good new world proportion, the flavours long and dry. 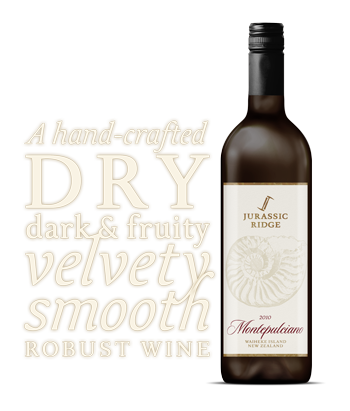 This is benchmark montepulciano, a grape which is doing exceptionally well on Waiheke Island. The 2008 vintage Montepulciano was a Gold Medal and Champion Trophy at the Bragato; the 2009judged 5-star and 'benchmark Montepulciano' in the Geoff Kelly Wine reviews. This one, from that great 2010 vintage, was first released at the Island of Wine, Waiheke Expo at Viaduct Harbour in September 2014. It is made in the style of the great Montepulciano Abruzzo Riservas with prolonged oak contact. As befits the 'once-in-a-lifetime' vintage from that 100 yearevent, this one is massively concentrated with complex fruit (Xmas cake/plum pudding) and spice. Despite its youth, the big, soft and voluptuous tannins are expressing themselves beautifully. Cellaring potential for 15 perhaps 20 years, but this one will sell out faster than the 2008 and 2009 vintages. 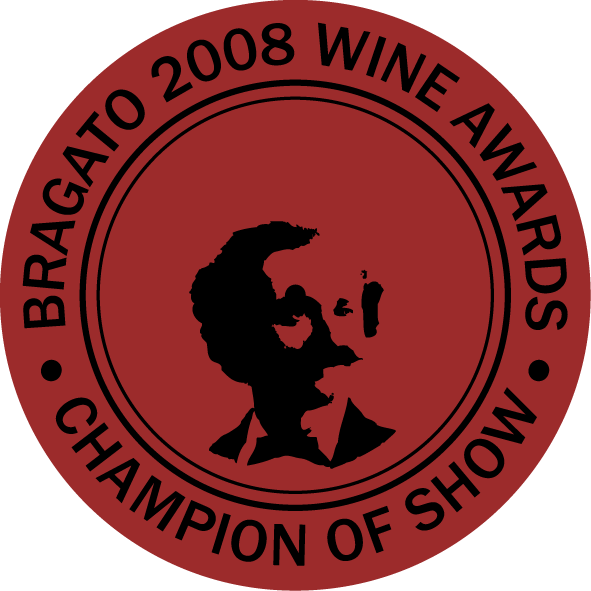 The power of this grape variety to perform, even in what some had considered a 'poor year' due to adverse weather, is illustrated by this elegant wine with all the typical varietal characteristics in a lighter than usual body (that is, by the standards of the Jurassic Ridge vineyard). 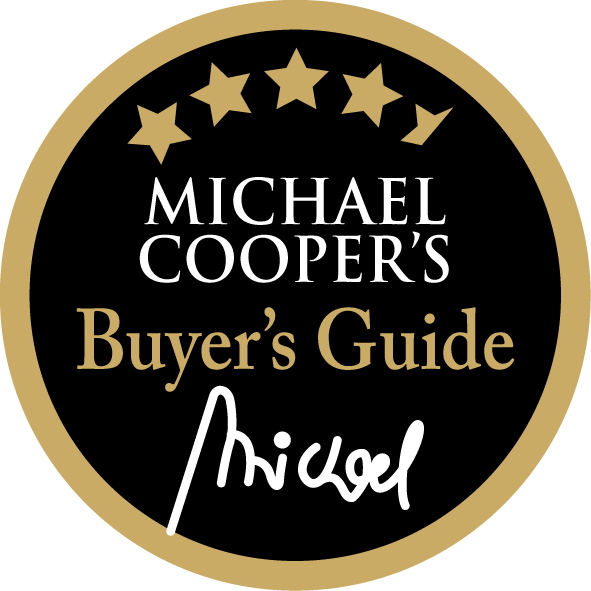 This makes for a smooth, soft, easy-drinking style which can be enjoyed now after just 8 years of cellar ageing without the need for any further cellaring. A typical silky-smooth fruit-packed single vineyard Monte that is just a baby but drinking well with its voluptuous fine tannins and lingering 'plum pudding' flavours. Cellar-aged to an early intermediate stage and released 1 November 2016. If you have a good cellar it could be cellared for 10 years or more.